This last week the weather has been amazing in North Wales, temperatures have regularly been into the upper 20's. 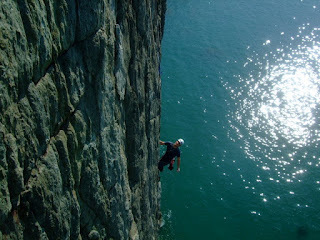 Mid week I spent a couple of days living in the van and climbing on Anglesey with Luke Brooks. 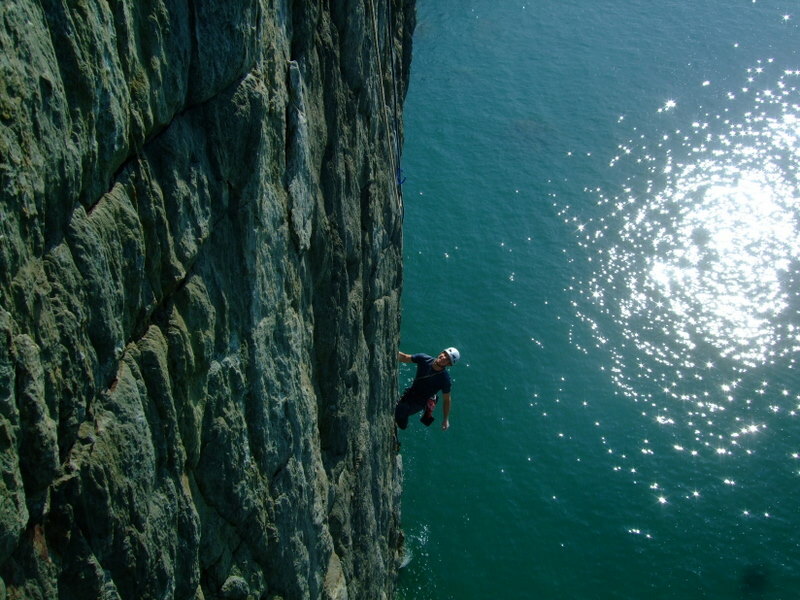 On the first day we got some hot and sweaty crag miles in at Rhoscolyn: climbing Mask of the Red Death E3 5c and Wild Rover E1 5b with a coffee and ice cream break in-between, then finishing the day on Centrefold E3 5c. 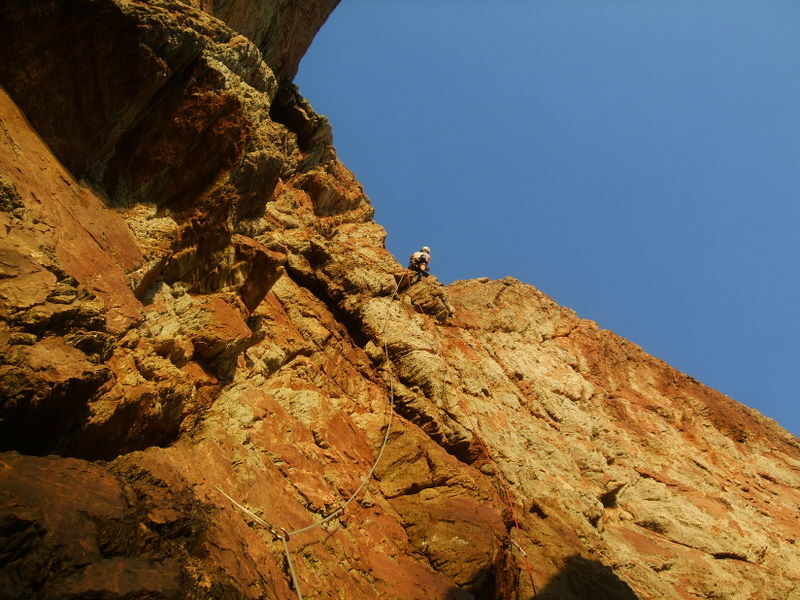 Centrefold in particular was amazing; great climbing, well protected and in lovely golden evening light. On the second day we ventured onto Gogarth Main cliff nice and early to get on Ordinary Route. 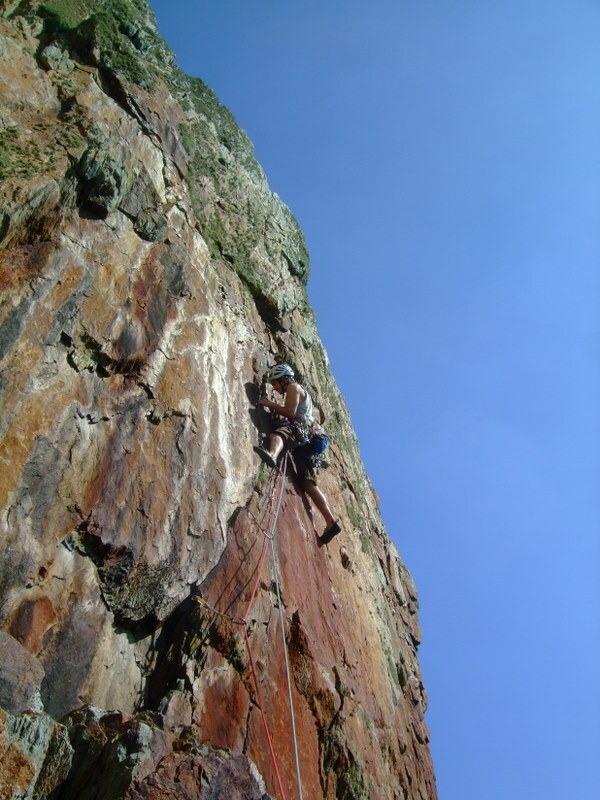 The name is a bit misleading, it's the only 5-pitch E5 6a 'ordinary route' I've ever done! 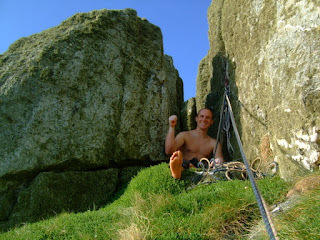 Luke smashed out the first meaty 6a pitch before the sun hit the crag. I got the second pitch which was the pumpy Positron headwall crack pitch. Despite early season lack of fitness I battled my way along the rising crack line, fighting the pump till I was a few feet from the belay. 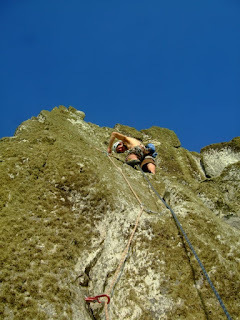 Here I started trying to go directly left to the belay in the Mammoth chimney, which was hard, at this point I succumbed to the lactic acid in my arms and rested on some gear. Now more chilled I realised that the route goes up for a few meters before moving left into the chimney, via some easier moves higher up. Finally I reached the hanging 'belay' in the overhanging Mammoth chimney, which was not really much of a rest. Even setting up the belay was a fight against the pump! 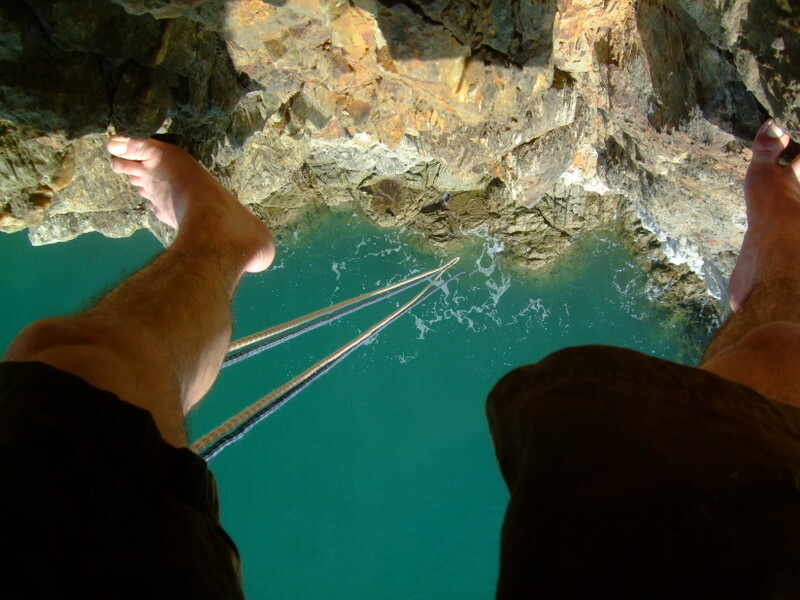 With the belay set up and clipped into I sat back limply in my harness, removed my tight climbing shoes and prepared myself for 2hrs of uncomfortable and dizzyingly exposed free hanging above the sea. 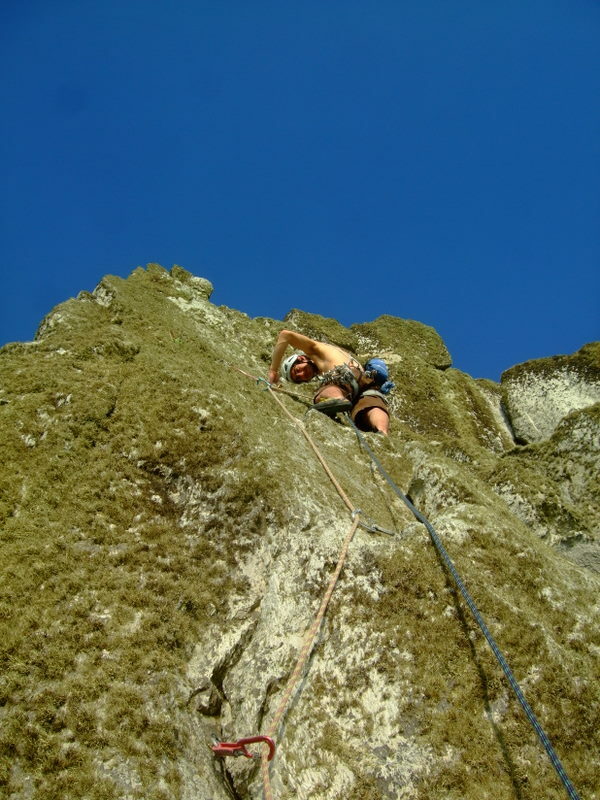 Luke shuffled his way along the next pitch which was 40m of 5c traverse, crossing all the most impressive and steep bits of Main Cliff. It was not without drama, Luke pulled off a hold and experienced his shoulder semi dislocating itself during a reverse-arm-barring move. This pitch made for a spicy second. By the time I reached the belay we had been in direct sun for over 4 hours with limited water, it was fair to say we were both feeling pretty goosed. Two more pitches remained. These were dispatched much more easily, but they were still mentally tiring; negotiating loose rock and Gogarth grass. Luke enjoying a non-hanging belay! 6 hours after starting the first pitch we arrived at the top of the crag, sun baked, de-hydrated and very satisfied to have experienced a fine adventure on a fine cliff on a very fine day. 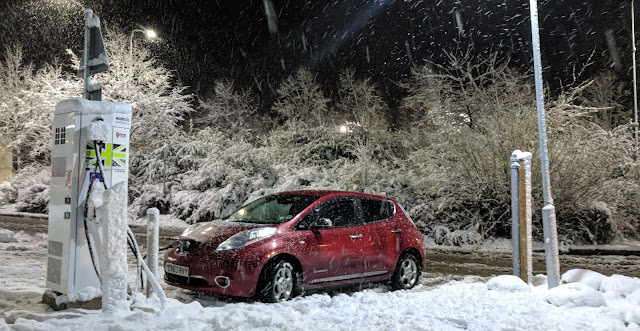 The last couple of days I've found myself down in Bristol after missioning it down in the van on whim after Amy locked her self out of her house. My van stepped in to provide temporary accommodation complete with me, van cooked curry, red wine and good music. 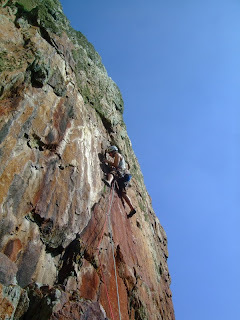 The next day which happened to be Sunday I went climbing at Brean Down with some good friends. Brean Down is renowned for being a total Southern sun-trap, Sunday was no exception. After warming up I surprised myself by managing to flash Storm Warming 7c+! Although it was very soft for 7c+. Today Amy and I headed to Cheddar Gorge. 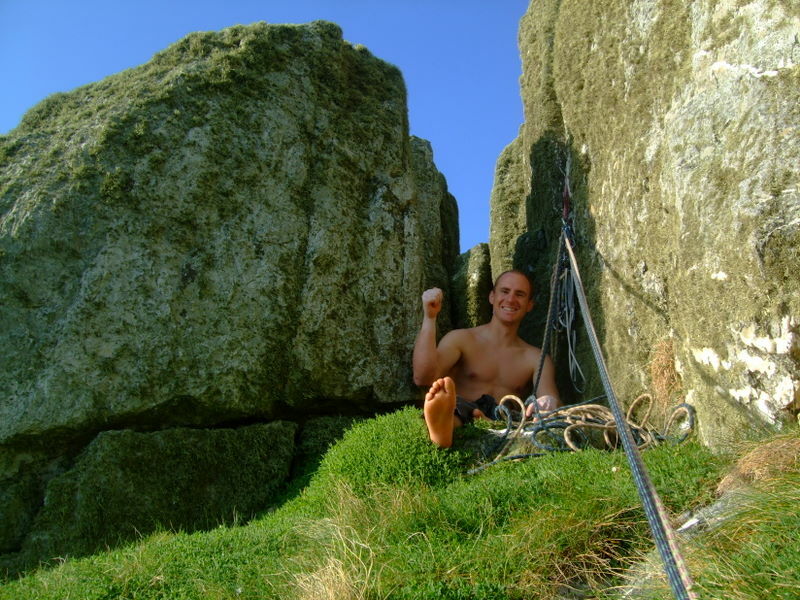 Unfortunately Cheddar Outdoor, the only source for the Cheddar climbing guidebook had completely sold out. So we spent the day following the sun around the gorge climbing whatever lines took our fancy! It was actually a very refreshing climbing experience, I would recommend everyone to try climbing information blind at some point! When setting out on a route it was nice not to have any grade preconceptions or expectations. Routes today only had two grades, one's that I could climb and one's I couldn't!